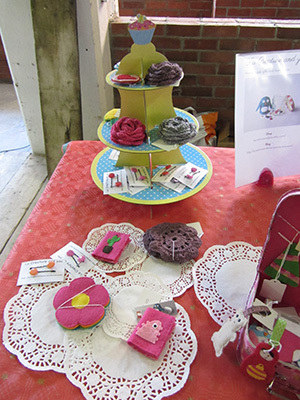 So on Saturday, I was holding a stall at the first Christmas Fair in the Chocolate Factory. That was a hell of a cold day but a really interesting one too. I was really well prepared thanks to fellow crafters who shared their experience in other blog posts, most ot them being listed in this Handmadeology post. But nothing beats real life experience. I got to figure out what it would take to make my stall more attractive and give it a more professional look. As hard as I worked, I hadn’t made enough things to sell. And it wasn’t clear to people what each thing was. Having several of each design and grouping them in baskets or boxes with a visible sign with name and price would have helped a lot. On the day the footfall was quite low and the place was very cold but I got to meet brilliant people. To name only a few, Old Book Hides make notebooks out of old books. As I am a paper and notebook addict I can tell you I became a customer of theirs. I also got to meet in real life a fellow Etsy seller: Renee from Candy Mountain Photos whose work I really like. All in all a good experience. I will definitely take part into more fairs next year!